Like Ryan Trebon and Barry Wicks, I am six-foot-five-inches tall. Yet, I can say with a high level of certainty, earned through years of middling results, that extraordinary height alone does not guarantee cyclocross success. I will never step foot onto the podium of an elite level race and I’m okay with that. But what about reaching the top five of my regional series? If I put in the time and summon the motivation, shouldn’t that be possible? We’ve all read the articles, watched the videos, and digested the free online coaching tips. Is that all there is to it? VO2 max intervals and smoothly suitcasing your bike? To find out how to reach the top, I went to the people-the electrician, the accountant, the stay-at-home dad-to see what it is that they did to get on their regional podium. As it turns out, success follows a fairly straightforward formula. The articles, videos and online coaching advice are pretty much spot-on. But the key to making it work is more nuanced. It’s the little things the rider at the front of the race does differently from the rider at the back. 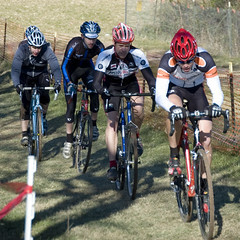 Master these skills and in no time you will be posting up at the finish line of the Anytown Cyclocross Classic. Sounds easy enough, so let’s start unveiling the secrets! Okay, maybe it’s not that simple. And before I go all Deepak Chopra on everybody, and try to convince you that mind over body is all it takes, let me say for the record that for Joe-the-Cyclist, winning is hard. The truth is that cyclocross is Darwinism on wheels. The rider at the front is better than you. Most likely she is putting in a higher intensity training load, can produce much higher wattage and adapt quicker to race conditions than the person finishing DFL. But what about the guy that continues to finish one spot above you week after week. How do you climb over him on your way to the top step of the podium? My theory is that it comes down to nuance, to sweating the small stuff. To find out if I am right, I conducted a series of interviews with podium finishers from the Mid-Atlantic’s MABRA, MAC and VACX series with a bit of flavor provided by West Michigan’s Kisscross series. These interviews look at the sublime and the mundane of cyclocross racing. In this article, I focus on the latter, pre-race food. Cyclists are ritualistic by nature and there is not a more basic ritual than food. Whether it is turkey on Thanksgiving, a whole suckling pig for Chinese weddings, or latkes for Hanukkah, most meaningful events are marked with food. Cyclocross is no different. There's an Egg McMuffin in the mix, here. The conventional wisdom is that you eat breakfast at least two hours before the race and then throw down a bar or gel 15 to 30 minutes before the start. And that is precisely the routine followed by most of the podium finishers I interviewed. Breakfast staples seem to fall into three camps: (1) just the carbs-steel-cut oats, oatmeal or kashi; (2) carbs with some protein-bagel and cream cheese or peanut butter toast; or (3) the lumberjack-bacon, eggs or a side of beef. It pretty much comes down to eating what your body is used to and keeping a routine. Of course if your routine isn’t getting it done, you could follow Matt Parse and pick up some pre-race Mickey Dees. “An Egg McMuffin is a gotta have for me,” Parse swears after reaching the Men 3/4 podium at Tacchino Ciclocross in Leesburg, Virginia. Hold everything. Did he really say a donut? The typical image of a bike racer is a stoic stick figure that shuns anything glazed, dipped or sugarcoated. Cross doesn’t seem to play by these rules. I found many racers happy to admit that they throw a donut or two into their pre-race mix. But fair warning Krispy Kreme aficionados, a donut alone is not going to get it done. Consider the case of elite masters racer and ADG cycling coach Kris Auer. After a late arrival to the Tacchino Ciclocross, Auer only had time for a donut and a large cup of coffee. He placed second. One week later, at the MABRA CX Championship in Taneytown, Maryland, Auer again started his day with a large coffee and donuts. But for this race, he added steel cut oats to his pre-race meal. The result: he won. The lesson is simple, donuts are fine, but donuts alone will keep you off the top step. Kris may argue that the difference between winning and losing comes down to more than donuts. But my decidedly less than scientific research proves otherwise. No coffee drinkers on this podium. PB&J? Likely. The Internets are full of conflicting advice about how diet is the key to success. Cut your carbs. Increase your carbs. Eat only green foods. Take supplements. Avoid supplements. Sure, you can buy a gram scale, weigh your food and maximize your watts per kilogram ratio. But in the end it may be nothing more than trading in the Jif for the Aunt Jemima that gives you that edge. For Jay Morali that’s all it took to take him to the next level. “Two weeks in a row I had French toast after switching from PB&J,” Morali told me. “And two weeks in a row [MABRA Championship and Capital ‘Cross], I’m on the [top of the] podium.” No Government approved food pyramids, no calorie counting, just some French toast. Jay is upgrading for next season. My advice for him: French toast and a donut. Up to this point my focus has been on getting ahead in your local scene. But what happens if you dial in the donut consumption, catapult to the top of your regional standings, and want to take it to the next level. Will the lessons learned here still apply? Unconvinced that oatmeal is the key? Katie Compton is arguably the most dominant CX racer on the planet. Not surprisingly, her pre-race meal of choice is, you guessed it, oatmeal. But being a true champion, Compton knows how to take it to a level where mere mortals dare not go. 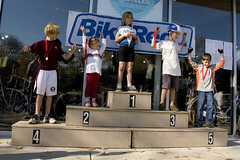 She told CXM after winning the 2007 national jersey that her oatmeal includes peanut butter, nuts and raisins. Top this off with a banana and coffee and it’s not hard to see why Katie dominates. Can you imagine how successful she would be if she threw a cream-filled into the mix?